OPEN HOUSE IN MOUNT LOOKOUT! Location and style highlight this English Tudor, nested in sought-out Mt. Lookout neighborhood, walking distance from Kilgour Schools. Location and style define this one! Sit and enjoy a Sunday morning coffee on the cozy, covered front porch and paver stone patio, or walk down to Mt. Lookout Square and enjoy the square’s scene and sights! Enjoy hardwood floors, natural woodwork, arched doorways, tall ceilings and a Rookwood wood burning fireplace. The sleek eat-in kitchen offers expansive granite counters, stainless steel appliances and tile floor. Hi-efficiency Lennox furnace and A/C ’13 with a two-car garage. 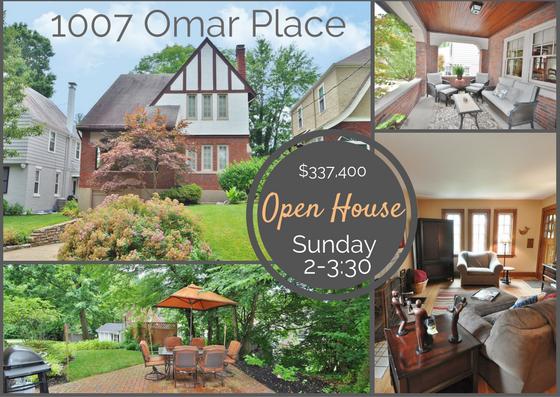 Conveniently located close to Hyde Park Square, Ault Park, and Alms Park, and just a hop, skip and jump from downtown. Don’t pass this one up! Come see us Sunday for more information and to see this beauty firsthand! As always, call or email us with any questions or for showings for this (or any other) home! Coming on the Market Soon in Oakley! Join us for an open house this Thursday, February 18th from 4:00-6:00pm. Everyone is welcome! We will be serving coffee/hot chocolate from Redtree Art Gallery and Coffee Shop and sweets from Aglamesis. The home is located at 3807 Drake Avenue in Oakley will hit the Multiple Listing Service on Wednesday, February 17th. It will be available for showings starting on the February 18th. Prime location in Oakley! Ideal open floor plan offers space and style. Move right into this renovated home, and enjoy your walkable lifestyle! The kitchen is open with exposed brick, peninsula seating, hardwood floors, wood cabinetry, quartz counters, stainless steel appliances, and walkout to patio. Very deep lot for the area! Custom paver patio, professional landscaping, flat yard, two storage sheds, privacy fence, and plenty of driveway parking. Powder room on first floor, remodeled full bath on second floor. Three bedrooms on second floor, plus family room on third floor. Master Bedroom with large walk-in closet! Great curb appeal with the paver stone walkway, professional landscaping, and large covered front porch with porch swing. Great spot to relax this Spring! Step into the welcoming foyer, and notice some of the many features…crown molding, replacement windows, custom wood blinds, high ceilings, hardwood floors, high efficiency heating/central air. New roof 2015, New hot water heater 2015, Exterior painted 2015. Move right in! The amazing success of Kilgour School’s annual Silent Auction event over the years inspired organizers to find a larger venue this year. Kilgour PTA hosted its annual fundraiser at The Center, formerly the Contemporary Arts Center, 115 E. Fifth St. on Nov. 13 with Village Pantry Catering. The 2015 Kilgour Silent Auction was a huge success with hundreds of people in attendance and over 400 silent auction items! Thank you to all of the businesses that donated items to the event. Your donation is making a difference in the education of many children! Also, thank you to the major sponsors for the year which include: Lifetime Financial Growth, Sea of Smiles, Zimmer Heating and Cooling, Redtree Art Gallery & Coffee Shop, Sterling Homes, Camp Kooch-I-Ching, Finn Team with Coldwell Banker, and Barron Peck Bennie & Schlemmer. Rick and Holly Finn, with the Finn Team at Coldwell Banker, understand that having great public school options is an important factor for real estate values in a neighborhood. The Finn Team is happy to support Kilgour, which provides an excellent education for children in the City of Cincinnati. Contact us if you would like to donate anything to the event in 2016, or if you have a public school fundraiser in need of sponsorships for the 2016 year.